Yes, you’re right: good financial habits are hard to form. The idea that you’re either “good” or “bad with money” is a myth. Good money habits are a choice that anyone can make and being “good with money” is something you can learn. That doesn’t mean good money habits are easy to form, and it can be a massive struggle and challenge to make the change you want to see in your financial life. I get that and I want to acknowledge it, because a recent experience made me empathize with people in a whole new way. Right now, I am, generally speaking, a fully functional human being. I’m healthy, I’m fit, I work out, I do strenuous exercise, and I’m perfectly capable of doing that hard physical work. I can continue doing all these things and be okay. There’s nothing drastically wrong. But I know that, due to old injuries and the simple fact that we all get a little older every year, there are certain things that just don’t function as smoothly as they could. Specifically, my left shoulder and my right hip tend to get tight. I don’t want to hurt myself, so I try not to push it. I don’t perform at my maximum capability because those little things nag me enough to stop me from progressing. Again, nothing’s wrong. Things are fine… but “fine” doesn’t work if I want to perform at a higher level. “Fine” doesn’t help me to get to my highest potential for fitness and health. And even more importantly, “fine” doesn’t work if I want to be able to move and maintain a peak level of fitness throughout my entire life. As we age, it only gets harder to avoid injury, stay in shape, gain strength, and so on. If I don’t get proactive now, I’m going to be facing a situation I don’t want in the future: unable to do the things I physically want to do, hurting, not as healthy, and so on. The good news is that there’s a solution. We can focus on improving these things now, and solving the little problems before they blow up to be full-on issues that prevent us from moving and performing the way we want. Need help nailing your fitness goals? Schedule your FREE 60 minute Strategy Session with one of AMP's coaches! If you've been working out at a gym like AMP or have worked with qualified trainers in the past - you know that movement and performance based strength training is the way to go. Training movement patterns will help you feel your best and help you recover from any old and lingering injuries as well as limit future injuries that may pop up. There's no doubt that training this way will yield the best possible results for most people - but the process can be frustrating and quite challenging for most, especially a beginner. Functional training isn't something I would naturally know how to do, even though I’ve been an athlete my whole life. It’s not something that’s always fun to do, but I know going through these workouts is my access to a healthy body not just today but for decades into the future. And in going through this process, I realized my own clients often feel the exact same way about our process for getting them in financial shape to live out their best financial lives, today and decades into the future. I realize that there are certain things in life that may be frustrating or physically and emotionally painful in the beginning. Anytime you start a new journey to improve some aspect of yourself, you’re likely to feel challenged. You’re likely to struggle. My wife also goes to the gym. Her needs and goals are different than mine, but she’s experienced the same sort of frustration as she’s gotten started with this new process. Despite the fact that she’s been highly motivated to work on her fitness most days of the week, her workouts at the gym are challenging because they’re new and different. They weren’t something she was immediately good at, and she admitted that part of it was frustrating. And it’s true: it’s not fun having to work away at something that you’re not good at. But she and I both know that these unique — and challenging, and sometimes painful — workouts are the actions we have to take to get to where we want to go. And she knows that the more she works at it, the better she’ll get. There’s a learning curve that’s tough. But it’s part of the process and it doesn’t mean it will be tough forever. Good money habits are absolutely critical to your health, but they don’t just develop overnight. Creating them might not feel like something you’re naturally good at. It takes time and the process of going from “starting point” to “financial success” can feel challenging, frustrating, and yes, even painful too! Building good habits is tough. No doubt about it. And the tricky thing is, you don’t necessarily have to work hard at building good habits. You could settle for that state of being just okay. Of being fine. Could you just do the bare minimum and be okay? Sure. Or at least, it looks like you can get away with a lot until you’re 20 years down the road and you realize there were much bigger consequences to your inaction or reactivity than you thought there would be. As with physical fitness and health, you often have to make a choice when it comes to your finances: are you going to do what’s good (or just acceptable) for you now or what’s good for you in the future? The tightness you might feel in your muscles — or in your budget, for that matter — isn’t going to get any better. It’s not going to magically improve. You have to work at it. You have to put in the work to improve. I had to seek out a highly specialized personal trainer to coach me and hold me accountable to doing the things that, honestly, I don’t really want to do right now. If left up to my own devices there’s no way I’d put myself through the workouts the trainer guides me though. And that’s exactly why I hired him and work with him once a week. It’s not even that these workouts are (at least not now) extremely intense. But we are in the process of training my brain to activate various muscles that aren’t currently pulling their weight… and it REALLY hurts, both physically and mentally! I don’t want to do those things but I know I have to do them if I want to get to the next level, if I want to move and perform and feel better — now, and most importantly, well into the future. 1. Start now. The longer you wait to nail your financial habits the more challenging it becomes. Whether it’s a major overhaul of your financial habits or just minor tweaks that you need to make, yes, there may be some pain or frustration that comes along with making a change. 2. Work with a coach. Whether you don't know where to start or find yourself knowing what to do but failing to pull the trigger, find help. A good coach or financial planner will help you succeed by providing guidance, accountability and support. 3. Keep Getting 1% better. Just like they teach at AMP Fitness, you can always start where you are and work to get even just 1% better every day. Pretty soon getting better than 'just fine' will add up! Want to learn how to make mindful decisions with your money? Join us on at AMP on Saturday, July 21st at 2:00pm for a Financial Fitness Workshop with Eric Roberge. 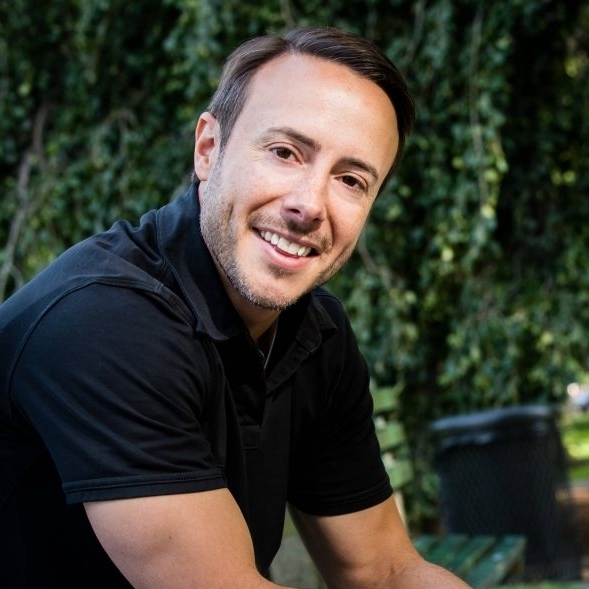 Eric Roberge is a professional speaker, Certified Financial Planner and the founder of Beyond Your Hammock, a Boston-based financial planning firm that helps professionals in their 30s and 40s make mindful decisions. His passion lies in helping others transform the way they see, talk about, and and use money in their lives. Expertise.com ranked Eric as one of the Best Financial Advisors in Boston and Financial Advisor Magazine said he is one of the top 10 Young Advisors to Watch. He is one of Investopedia’s Top 100 Most Influential Financial Advisors and a member of InvestmentNews’ exclusive 40 Under 40 class of 2016.